At Garnet Hill we enjoy the outdoors. 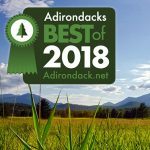 Many of the sports we love — skiing, snowshoeing, hiking, biking, paddling and rafting — are affected by forecast so we watch Adirondack weather conditions closely. Our elevation (2000 feet) has a real impact on the weather forecast up high in North River. The weather here can be very different from what you’ll see in New York City, downstate, Albany or Glens Falls. Warrensburg can see rain when it is snowing at Garnet Hill. Often forecasts for Indian Lake at 1700 feet are more representative for what is happening on the hill than predictions for North Creek or even North River. Good sources to check for Adirondack weather forecasts are the NWS Albany and the NWS Burlington Forecast Discussions. This analysis is updated with twice a day by meteorologists who spend their day pouring over the various weather models. Garnet Hill is positioned right on the edge of each of the two coverage areas and often you have to interpolate your own forecast, using a combination of the input from the two NWS offices. We find this analysis to be really valuable. In addition, weather underground provides current weather and forecasts for Garnet Hill with a local data collection station. Another valuable resource for us at Garnet Hill, especially in winter, is the NYSB weather page and weather forums at NYSkiBlog.com. The Albany weather page is loaded with valuable data for New York skiers. The NYSB forum has large audience that skis in the Adirondacks and at Gore Mountain, many who are skilled amateur meteorologists. We also follow Darrin Harr the accomplished meteorologist at ilsnow.com. You can always call the Outdoor Center (518) 251-2150 or the front desk (518) 251-2444 for up to date weather and trail conditions. Or check this weather page to look at the same forecast data we check to see into the future. We’ve got the highest elevation webcam in Warren County to give you an even better view into what is happening up high on our trail network and at Gore Mountain too.